Amberleigh is Morningstar Homes' 4th develoment on Burke Mountain, Coquitlam, and is closing the doors on their last remaining showhome. This development follows in the footsteps of Morningstar's success at Belmont, Sterling, and Avondale. 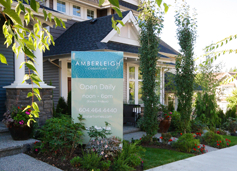 Amberleigh is located north of David Avenue on the west side of Coast Meridian (just below the Belmont development). Amberleigh features 67 village-style single family homes ranging in size from 3,096 sq.ft. to 3,238 sq.ft. There are three and four-bedroom floorplans, each with a detached garage, gourmet kitchens, granite countertops, gorgeous master ensuites, hardwood flooring and Kohler fixtures. Basements will be unfinished, but Morningstar will be offering the option to finish it if you choose. Amberleigh by Morningstar Homes is now completely SOLD OUT. Ellsworth - 3br, 2.5ba, 3,056 sqft. Ellsworth Uphill - 3br, 2.5ba, 3,056 sqft. Hillcrest - 4br, 2.5ba, 3,010 sqft. Hillcrest Uphill - 4br, 2.5ba, 3,010 sqft. Meadow View - 3br, 2.5ba, 3,096 sqft. Meadow View Uphill - 3br, 2.5ba, 3,096 sqft.